As a mom of three boys, I had often struggled with the kids fighting when they were younger. Now when the kids were really young, they all got along great, but somewhere past elementary school that all seemed to change. Somehow, someway, no matter what we did as parents, everything became a competition. Either one child thought they were loved less than another child, or they were always trying to outdo each other in grades or sports. This is a difficult situation for parents and kids alike. We tried to create an environment where our kids did not think they had to compete with each other but honestly nothing we did really made a difference. It got so bad that I was afraid if anything every happened to my husband and I, the kids might not even talk to each other to figure out funeral arrangements and final requirements. I know, morbid, but these are the things I think about as I near fifty. I actually expect to be here for many years to come but unfortunately my brothers untimely death at 42 taught me that you never know what the future will bring. Fast forward a few years and our youngest is in high school, one is in college and another has already completed his education. With the age of technology, our kids always seem to be focused on cellphones and computers and less on spending time with the family. gets to reconnect and just have some fun for a change. As a mom, I can honestly say the best gift I could have ever received for Christmas I received on Christmas Eve this year. First off the younger two always fought, it just got worse as they got older. So imagine my shock when the younger ones were playing games together, asking each other for advice and helping around the house. Christmas Eve we played board games with the family and I honestly can’t remember laughing so much. Everyone in the family got along so well and I think that is the absolute best gift I could have ever imagined. My hubby and I just stared at each other in awe of what was happening. The joy of Christmas, the opportunity for family to reconnect and spend family time together is something so magical. I am thankful for these opportunities and thank God that these little miracles exist. Next time you decide it is not important to get together with family over the holidays, think again. You never know what life holds. Enjoy the time you have with those you love. Merry Christmas and Happy New Year to everyone. My wish for you is many holiday memories this holiday season. 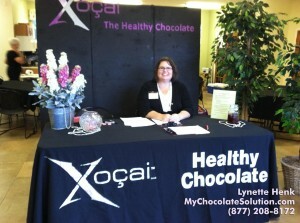 I am Lynette Henk, XO Business Consultant. I can be reached at 941-216-5727, at [email protected] or at GetRippedandRichNow.com. NextHave You Tried The Good For You Medicinal Dark Chocolate?